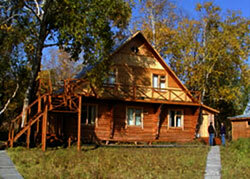 The comfortable, well-appointed Zendzur Hot Springs Lodge is located 10 miles upstream of the Zhupanova river gorge. Here the Zhupanova is large and shallow. Virtually every visiting angler lands the biggest rainbow trout of their life. In addition to huge trout, the Zhupanova provides tremendous fishing for Dolly Varden and Kundzha (an enormous, white-spotted sea-going char that can weigh-in at twenty or more pounds-woe for your trout rod!). The Lodge provides excellent food, comfortable rooms, hot showers, western and Russian guides, and reliable equipment. In addition to these top of the line facilities, the lodge features a natural hot spring which provides a wonderful capstone to a long day of angling, soaking in the 103 degree bubbling mineral water. Additionally, we offer fly-out options from Zendzur on a pay-as-you-go basis to Valley of the Geysers (the largest geyser basin outside of Yellowstone); overnight float trips on Zhupanova Spring Creek; day fishing trips to Kronotsky Lake for large char (up to 15 pounds); small coastal streams for rainbow, Coho, Dolly Varden, and Kundzha; and sightseeing trips to continuously erupting Mt. Karymski, landing at the base of the volcano. Anglers depart daily by jet boat for productive reaches of the middle Zhupanova River. There is one guide and two sponsors in each boat. 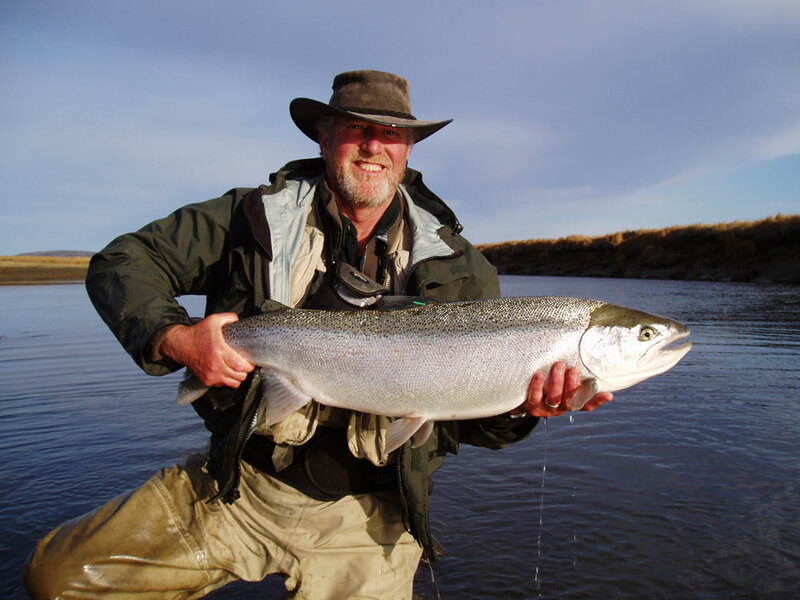 2011 Program: August 5-12; August 12-19; August 19-26; August 26-September 2 Price: $5,950 which includes seven angling days on the river, seven nights in camp, all food, guides, etc. Not included: gratuities, transportation to/from Kamchatka, visa fees, medical evacuation insurance (required), hotels/per diem enroute, personal alcohol. 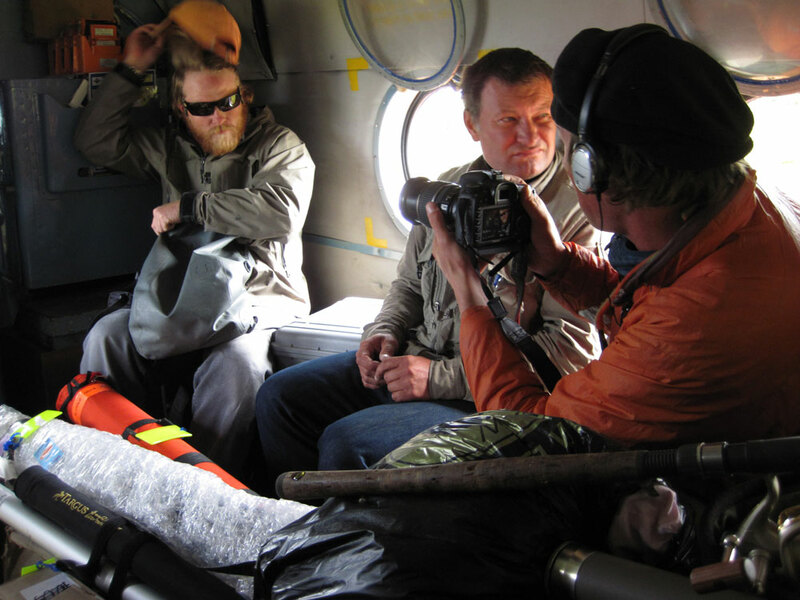 The Zhupanova River is easily reached by an hour long helicopter flight that takes you by several active volcanoes including the 11,339 foot Mt. Koryak and the 9,590 foot Mt. Zhupanova. You will be delighted by the stunning vistas of wild river valleys nestled amongst the mountain ranges of southeastern Kamchatka. The one-week program is limited to six sponsors per week. July-September. Call The Conservation Angler at 1-425 742 4651 for details on how to book. Availability is limited. Zhupanova River is a keystone study river. Zhupanova rainbow trout are, on average, very large and exhibit growth rates comparable to steelhead growth rates in the ocean. Interestingly, so far as we have been able to determine, rainbow trout are not present in the lower river which is an intriguing scientific mystery-what accounts for the unusually large size, a population dominated by older fish and why don't rainbow (which are normally highly migratory) utilize the food rich lower reaches of the Zhupanova-important questions that our anglers will help resolve. The Conservation Angler operates a luxurious float program on the upper Zhupanova River, covering about fifty miles of the river. Individual runs are fished, on average, for about 2 hours a week. Consequently, the fish are undisturbed and aggressive. This is the best fishing in the world for trophy rainbow trout with many fish ranging from 24 to 28 inches and some over 30 inches. Based upon long-term data collected by The Conservation Angler, 60% of all rainbow trout caught from the Zhupanova River are 24� or greater in length and are approximately 6-7 years old. Each day two anglers and their guide float about eight miles of pristine water between well-appointed, pre-established camps (comfortable, heated sleeping huts with frame beds, heated mess building, shower building with drying facility, cozy campfire, great food, top guides). You will float through stunning wilderness with bear, caribou, moose, badger, sable, fox and many species of raptors including Stellar sea eagle--the largest eagles in the world. 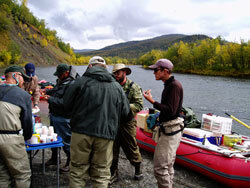 This trip is for the discriminating angler--luxury, unequaled trout fishing at a great price! The Zhupanova River is easily reached by a spectacular one hour helicopter ride from Petropavlovsk with a brief stop at the Zendzur Lodge along the way. The helicopter flight alone is a memorable trip that takes you by several active volcanoes including the 11,339 foot Mt. Koryak, the 9,590 foot Mt. Zhupanova, and past the continually erupting Mt. Kirimsky. BOOKING DETAILS The one-week program limited to six sponsors per week. July-September. Call The Conservation Angler at 1-425 742 4651 for details on how to book. Availability is limited.